The tomb of Saint Nicholas in Bari. Image credit: LooiNL on Wikipedia. According to legend, the bones of St. Nicholas secrete a sweet liquid, called manna, that is supposed to have healing powers. This legend of the manna of St. Nicholas starts in the 4th century in the town of Myra in modern-day Turkey. Saint Nicholas (ca. 270 – 343) was a Greek Bishop of Myra, who had a reputation for secret gift giving and became the model for Santa Claus. When he died in 343 AD, St. Nicholas was interred in a marble tomb in his cathedral in Myra and his remains were revered as holy relics. St. Nicholas’ tomb in Myra was said to emit a sweet smell and his bones secreted a miraculous manna that supposedly had healing powers. The original tomb of St. Nicholas in Myra. Image credit: Caricato da Panas on Wikipedia. Pilgrims traveled to Myra to venerate the relics of St. Nicholas until Muslim Turks conquered Turkey in 1071. In 1087, the bones of Saint Nicholas became the victim of the medieval relic industrial complex when Italian merchants from Bari stole the saint’s remains and brought them to Italy. Bari Basilica San Nicola. Image credit: Carlomorino on Wikipedia. St. Nicholas’ bones supposedly continued to leak the sweet-smelling liquid in Bari, much to the delight of the town. There are many theories about how the manna forms in St. Nicholas tomb, including the capillary action of ground or seawater and condensation in the tomb. Since 1980, the manna is harvested from the bottom of the tomb on May 9th, which is the Feast of the Translation of S. Nicholas from Myra to Bari. 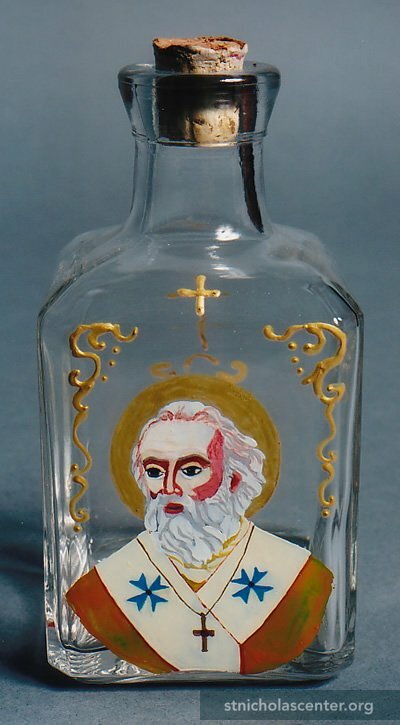 The manna is mixed with holy water, put in small glass bottles decorated with pictures of St. Nicholas, and sold to pilgrims. The “pure santa manna” is consumed as a drink or sprinkled on the body part that is hurting or suffering from an illness. When his tomb was opened in the 1950’s for repairs, St. Nicholas’ bones were found scattered in an inch of water and the marrow spaces were water-logged. During the documentary The Real Face of Santa (2004), forensic scientist Franco Introna put a camera into St. Nicholas’ tomb and discovered that his bones had deteriorated even more since the tomb-opening in the 1950’s because they were still immersed in water. I’m not interested in drinking liquid from old saintly bones, but I am dying to know what it tastes like!